Got a child who learns best by listening? Need a tool kids can use on their own? 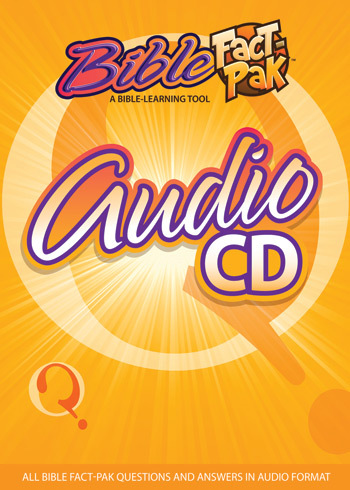 All 576 questions and answers of the Bible Fact-Pak come on this set of three professionally recorded CDs, one for each point level. Children listen to questions, provide their answer during a two-second pause, and then hear a child give the correct one. There are generally five questions per track allowing kids to more easily rewind or fast forward to the questions they need to review. Revised to align with the Fire Bible for Kids NIV. CD 1: 58 tracks with the 10 point questions 1–288. 63 minutes. CD 2: 38 tracks with the 20 point questions 289–480. 51 minutes. CD 3: 19 tracks with the 30 point questions 481–576. 37 minutes. - May be used as part of the Junior Bible Quiz ( JBQ ) program.